Nancy Jensen, and her husband Karl, have 3 heart-healthy sons and Jessica, who was born with tetralogy of Fallot, pulmonary atresia, severe pulmonary artery stenosis, no-confluent pulmonary branches, major aortopulmonary collateral arteries (or MAPCAs) and DiGeorge Syndrome. 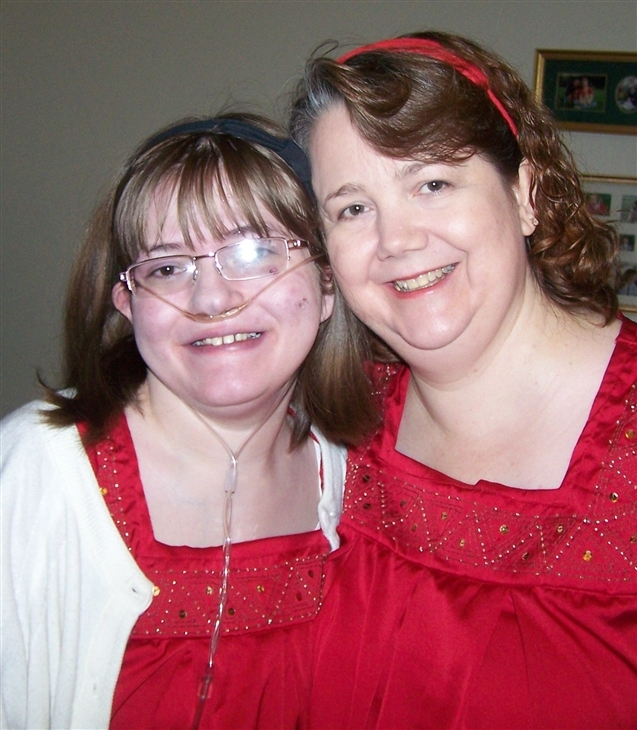 Jessica was very “blue” her whole life because, despite 5 heart surgeries, she never had a complete repair. Jessica became oxygen-dependent about 7 years of age and needed a motorized wheelchair at age 9 because walking became too difficult for her. Jessica had 2 strokes, which greatly affected her development. She eventually recovered from most of the physical deficits caused by the strokes – which surprised all of the specialists. Jessia started school at 3 years of age and remained in Special Education until she graduated from high school in 2008. Sadly, Jessica passed away on October 4, 2010. Although she wasn’t expected to survive childhood due to the severity of her CHDs, she amazed everyone. She was a happy, loving person who survived to be 22 years of age despite all of her medical issues.